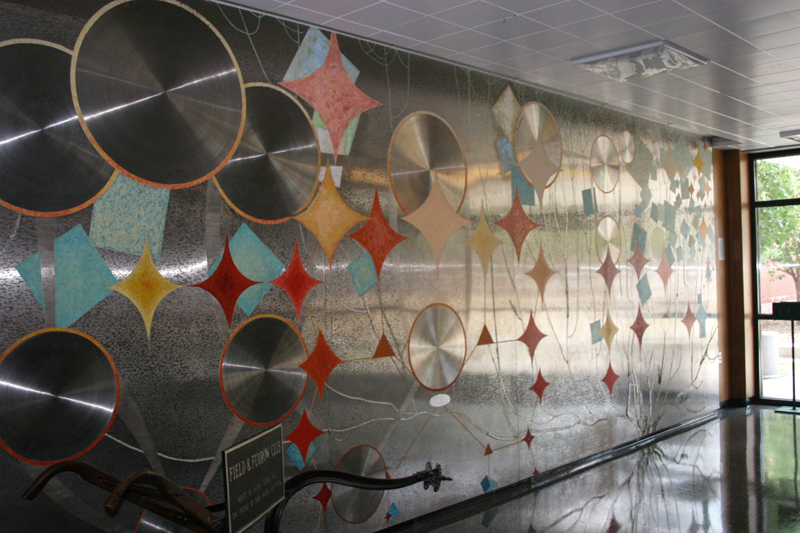 Artist Buell Mullen (1901-86) created this mural, which is made of stainless steel and epoxy. The 8' x 23' mural is displayed at the west entrance of Turner Hall. It was acquired as a gift in 1973 through the International Minerals and Chemical Corporation. 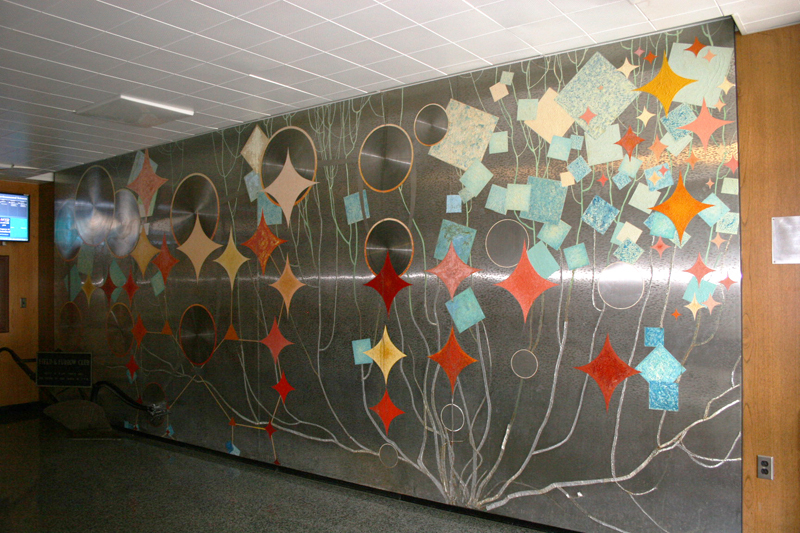 Buell Mullen designed and executed her 23-foot-long stainless steel and epoxy mural for the reception lobby of the International Minerals and Chemical Corporation, Libertyville, lllinois. With the building's remodeling in 1973, the piece was offered to the university and installed in Turner Hall in 1976. Ten inches had to be cut from its height in order for it to fit the cramped space, and after installation, Mullen came to touch up the design where it crosses seams between the four steel panels. So pleased was she with the university's attention to seeing the work done properly that she dispensed with her usual fee, remarking later that "it was a source of inspiration to see the great University that Illinois has become ... may she ever increase in stature." The mural, a complex yet uncluttered arrangement of organic and geometric shapes connected by heavily ridged bands and rods spreading across a silvery field, has as its theme "The Tree of Life." According to technical information taken from the appraiser's statement and the Turner Hall plaque, it depicts molecular forms of indoleacetic acid and chlorophyll, the two most important chemicals in the process of photosynthesis and plant growth. Ordinary molecular patterns show the structure of indoleacetic acid, the first known plant growth regulator. Buffed circular discs (some as large as thirty-three inches in diameter) representing carbon atoms are linked by etched bands signifying chemical bonds. A light blue ellipse, standing for magnesium, symbolizes the chlorophyll composition. Ocher lines link the chemical structure together. Bright warm red-orange and red tetrahedrons represent carbon; light blue squares stand for hydrogen; and colorless circles mean oxygen. The plant form is shown with roots at the bottom of the composition, as in nature; branches and stems gradually become greener as they move upward toward the ceiling light fixtures, which imply sunlight. The plant structure, chlorophyll, the sun, and indoleacetic acid all denote scientific knowledge relative to the biochemistry of plants. The artist's forms are arbitrary, not based on conventional scientific symbols. Without an explanation, even someone familiar with organic chemistry might find the mural's meaning elusive. 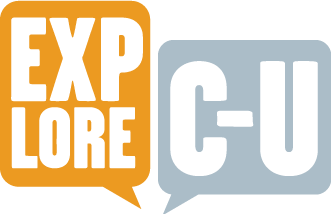 For the uninitiated, it is likely to be irrelevant. A more fundamental message, beyond the purely aesthetic, is communicated by the mural's abstract, impersonal, mechanistic components and by Mullen's heavy reliance on technology itself. Developing her unique method of painting on metals after eight years of rigorous experimentation-she worked on gold, monel, aluminum, copper, and chromium, besides stainless steel-Mullen learned how to accomplish a sound bond between epoxy resins and metals using a surface prepared by etching with acid. To achieve abraded and smooth textures and hard, durable finishes, she utilized electric sanders, carborundum discs, and vibro tools. Examples of her murals are in the Hispanic Room of the Library of Congress, the United States Naval Academy, the Chase Manhattan Bank in New York City, and Case Western Reserve. Metal portraits include those of President Eisenhower, General Pershing, Madame Chiang Kai-shek, and Cardinal Cushing. Muriel Scheinman, “The Tree of Life and Chemical Molecular Forms Essential to Plant Growth, 1966,” ExploreCU, accessed April 21, 2019, https://explorecu.org/items/show/34.